So, I love mexican inspired cuisine! I think the only reason I can successfully be a vegetarian (who eats fish and dairy) is because I LOVE beans. 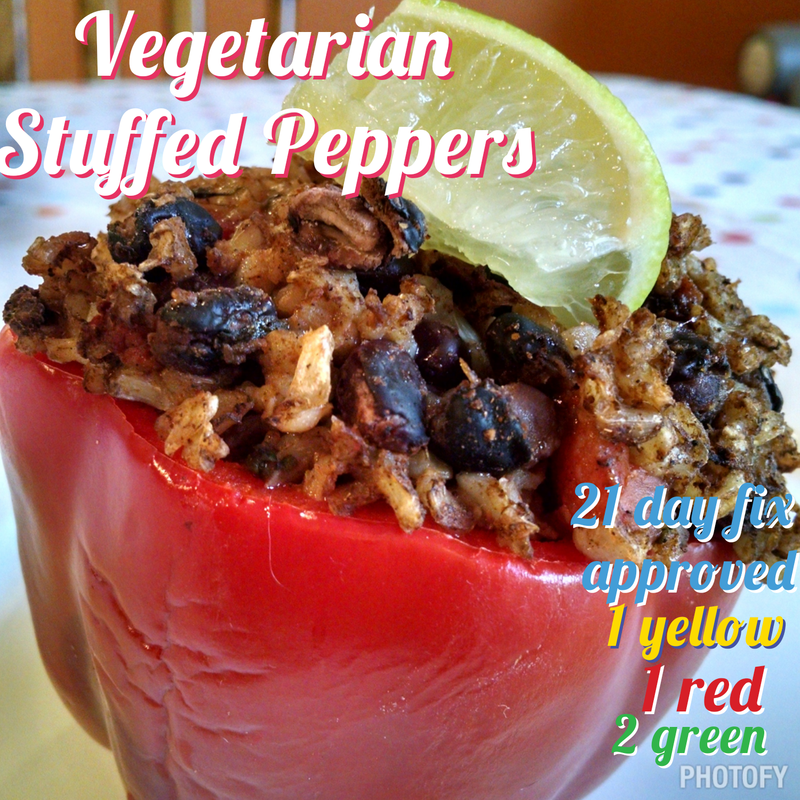 This stuffed pepper has EVERYTHING and it is delicious and filling. This is 21 day fix approved but you should know that I count my beans as a red container since I’m a vegetarian, if you’re a meat-atrian you would count this as 2 yellows and 2 green. I make the inside brown rice mixture at the beginning of the week and throw it in the pepper right before cooking so it’s already prepped and ready! In a large saucepan add water and brown rice/quinoa. Add taco seasoning , canned tomatoes (or diced), black beans and spinach- bring to a boil. Let cook for 20 minutes on medium-low, stirring occasionally. While you’re waiting, wash and cut the tops off of the bell peppers. Remove the seeds (throw away) and set the bell peppers aside. I cut the rest of the bell pepper off of the top and save for a salad later. Once the water has been absorbed remove from heat. If you’re making ahead of time, cool completely and store in the fridge until you’re ready to stuff the peppers. Stuff the brown rice/quinoa mixture into the pepper right before cooking. Top with cheese (OPTIONAL) and put in baking dish with a little water on the bottom. Cook for 30 minutes at 350 degrees. Squirt half a lime before serving on top, add a dollop of plain greek yogurt and sprinkle with the smoky southwest seasoning! Notes: When picking your bell peppers look for flat bottom peppers or you can slice a little off the bottom so that they sit right in the pan and do not topple over.